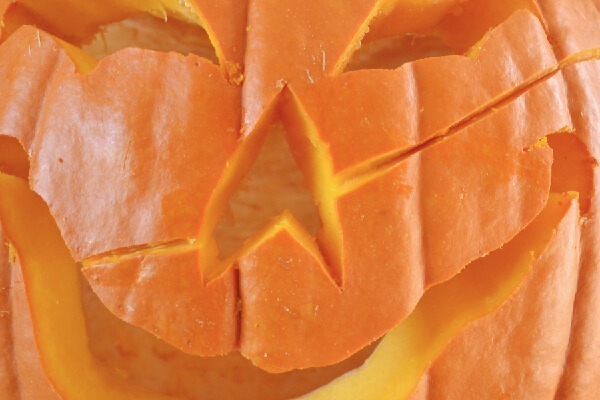 Isn’t carving jack-o-lanterns so much fun? I’m not talking about cleaning out the pumpkins in preparation to carve them, or lugging the rotten and disgusting fruit out to the dumpster days later, but the actual gettin’ into it carving. I LOVE carving pumpkins and I don’t really know why. I do remember as a kid getting to pick out my own pumpkin at the store. I almost always went short and fat and my sister went tall and skinny. 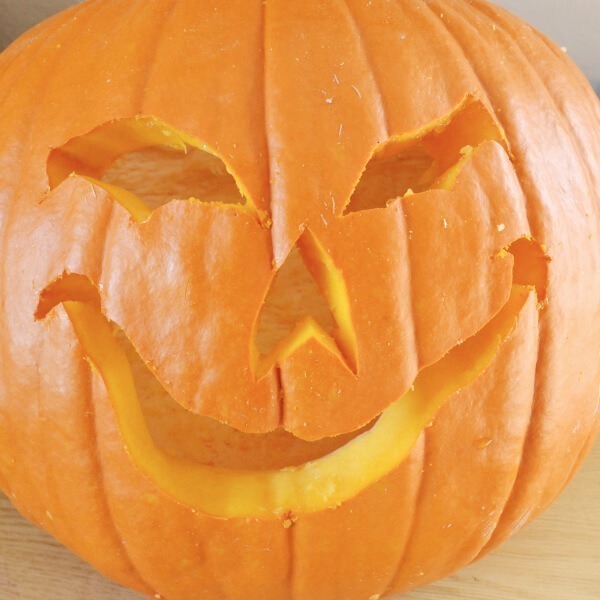 When we carved with my grandfather, Poppa would have us draw the face we wanted and then he’d take a gigantic kitchen knife (I think more for shock value than necessity) and slowly carve the pumpkin out for us. Honestly, he was just a slow fella’ in so many ways that it really wasn’t a surprise that it would take forever. I’d sit there at the table and watch him carve them both pumpkins and then we’d sit out on the grass and watch the candle light flicker inside of them. It was a huge deal and probably the reason behind my love of gourd carving. I decided that this go I wanted something a little bit different. Russell had mentioned a Frankenstein style and we kind of went back and forth over supper with ideas. And this stitched up jack-o’lantern is what I finally wound up carving out. 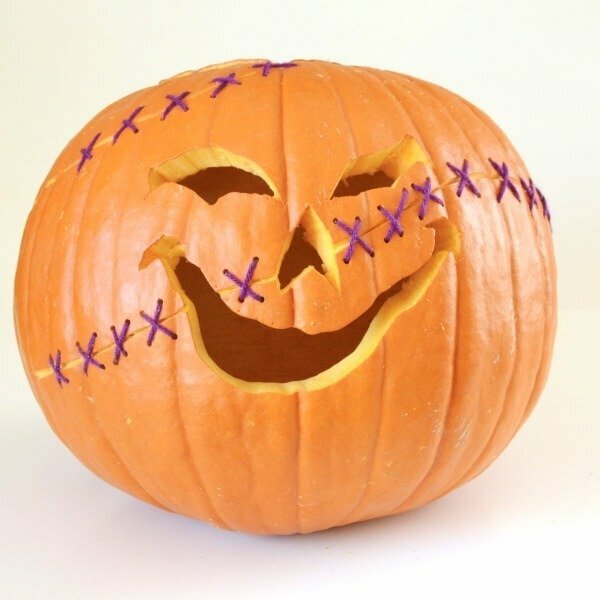 You’ll want your pumpkin carved fairly simply with big spaces still around each of the features like the eyes and the nose. 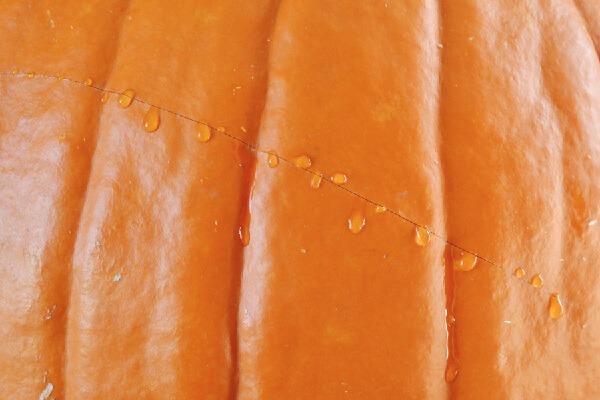 Take a knife with a really sharp tip and run a line around the pumpkin as you want the “scar” to appear. Draw a second line nearby and use the tip of your knife to begin prying the flesh out between the two. It’s actually pretty easy it kind of pops out in long, skinny chunks. 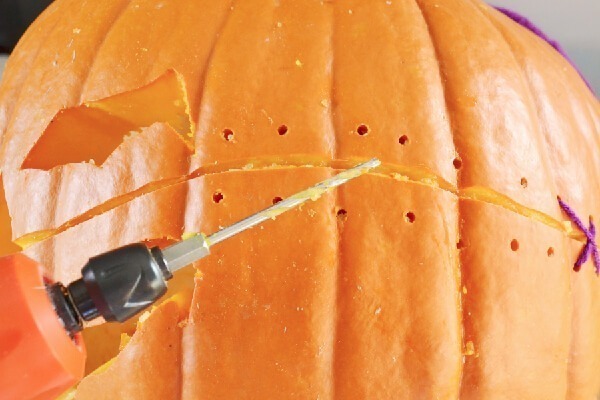 Take your drill and make little holes around the line you carved. To make your stitches wonky and off-kilter (and therefore more awesome) try not to follow a pattern. Place some closer together and some further apart. Some closer to the line and some farther away. 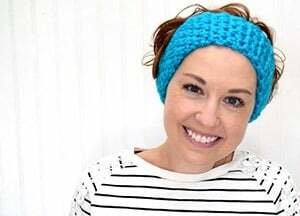 Make a set of four holes and move on (you’ll need four holes per stitch). Take care when you get close to your cut out features. You can easily drill through to where the yarn will be visible through the eyes or nose so keep that in mind. String about two feet of yarn onto your plastic needle and start stitching Xs out of the sets of four holes you made. Sometimes the hole might be hard to find from the inside, but you can push the needle through from the outside and see where it comes through to make that a lot easier. And just keep on going until the whole scar is stitched up. 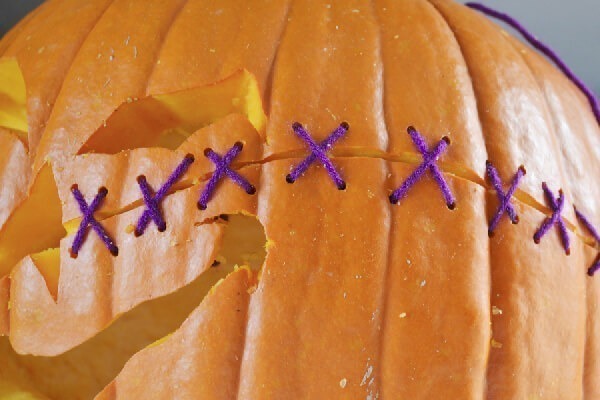 Feel free to keep adding scars and stitches as you please! 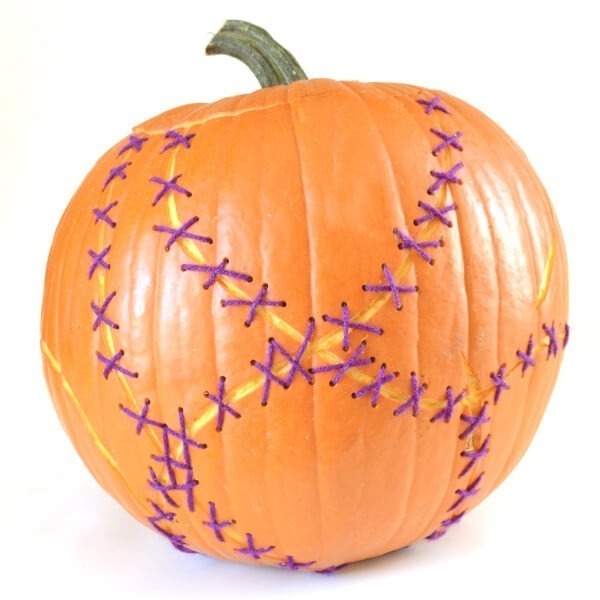 You can also stitch up a plain old pumpkin without a face for a Frankenstein pumpkin! And of course your jack doesn’t have to have a face. 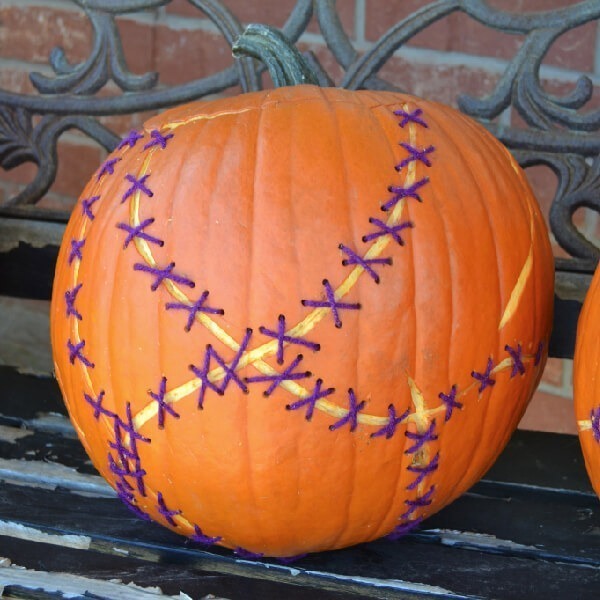 Simply carve lots and lots of scars and stitch them up. With the stitches at the bottom, I found it was much, much easier to sit facing a light source like a lamp. That way when you look inside the pin holes of light will help you find your drilled holes. 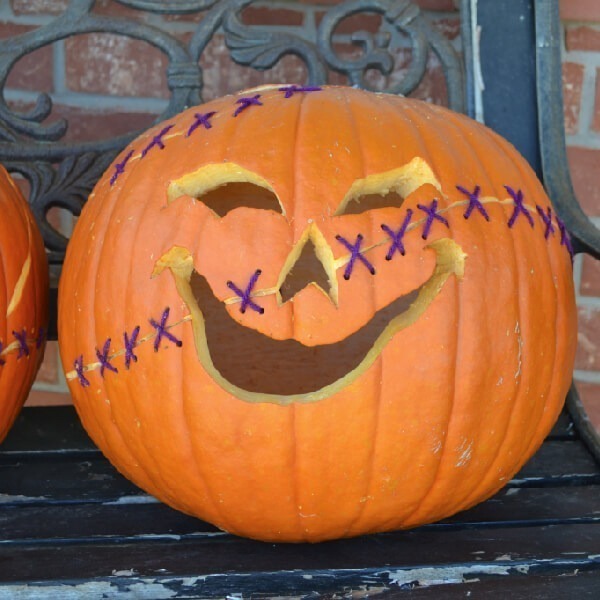 So will you be knocking out your own super fun stitched up jack-o’-lantern this Halloween? Guaranteed to be one of the more unique jacks on the block! Allison, those are so much fun! 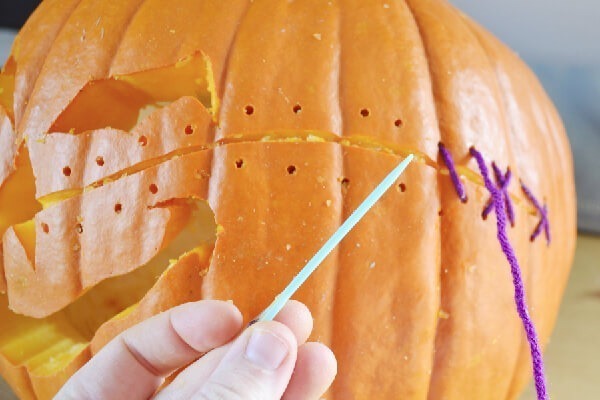 I may have to try it once I bite the bullet and scrape the guts out of our pumpkins. How do they look all lit up? The one without a face the glow is pretty minimal. I used a little battery operated light thing since there is no oxygen (and acrylic is flammable) but I was unimpressed with it at night-time. The one with the face has little pinholes of light around the features at night, but you really can’t tell a whole lot of difference. The stitching is only effective in daylight, really.